HOW Interactive Design Conference in lovely San Francisco and in one of our sessions we were asked this question. I’ll tell you I immediately thought of our very own Kregg Lee. The dude can flat out draw. He is truly an artist. Anybody who has seen his work can testify to that. But why did my brain automatically think of Kregg? Sure, he’s a creative superhero, but the thing my brain instantly connected creativity with is art. More likely than not, the person you thought of was also an artist or a writer of some kind. Even google does it. When you google the definition of creativity it reads, “the use of the imagination or original ideas, especially in the production of an artistic work.” The automatic association of creativity with art is not false, it’s just not what defines creativity as a whole. The idea that Creativity = Artistry is a misconception. Yes, you can be creative through art, but it’s just an outlet. You can be creative with how you put on pants in the morning if you want to. Stefan Mumaw is a writer of several books on creativity (so I’m going to assume he knows what he’s talking about) and his definition of creativity is problem solving with relevance and novelty. Relevance being the degree by which a problem is solved, and novelty being the uniqueness that that solution possesses. This speaks to the other misconception we have about creativity which is we think it’s a talent. It’s something that we’re born with. It’s in our genes. It’s in our soul. You have it or you don’t. The truth is, creativity is a skill. And just like any other skill, we can get better at it. Everyone is a problem solver. It’s how we’re able to get through our day and get things done. Solving a problem differently or uniquely is the tricky part. It takes practice. Think of creativity like a muscle. The more you go to the gym, the stronger you will be (how much creativity can you benchpress?). 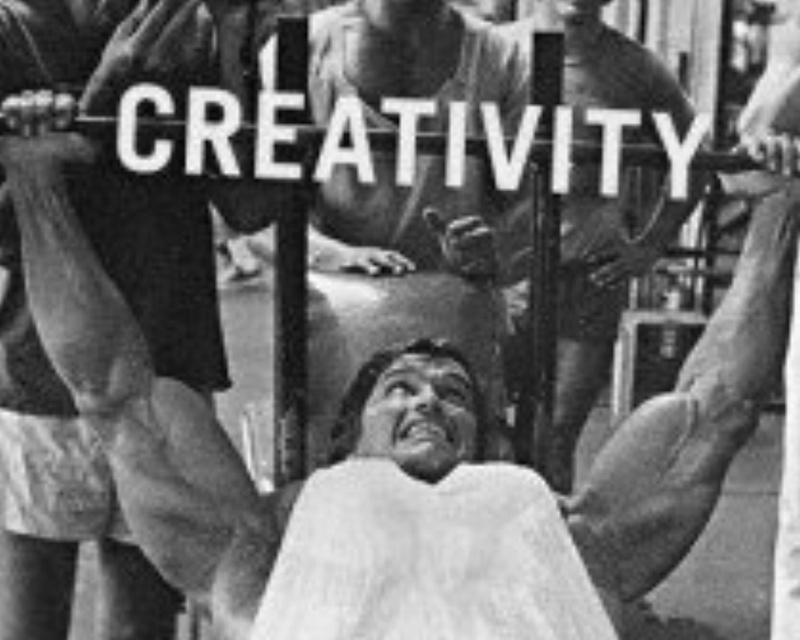 Artists, writers, designers, they’re gym rats for creativity. They’re in there pumping that creative iron all day, and they reek with creative stank. They practice and practice and practice and it gets easier and more natural. Everyone can be creative, and everyone can get better at being creative, and it doesn’t just benefit people like us in the marketing industry. Creativity has been the cornerstone for some of mankind’s greatest inventions and achievements. Everyone can use creativity to their advantage at their jobs and use it to enrich their daily lives. You just have to get in the gym.